Some sample examples of pictographs or pictorial representation are shown, how the objects are used to give information regarding mathematical data. Read the pictograph and gather the information from the different objects whose pictures or symbols are used in the table. 1. Number of red colored boxes sold by William, a shopkeeper, in six days of a week. See the picture graph or pictograph to answer the questions. (ii) Lowest sale – on Saturday, only 1 box was sold. Maximum sale on Friday is 8 boxes were sold. We can easily get more information by observing this picture-graph. 2. 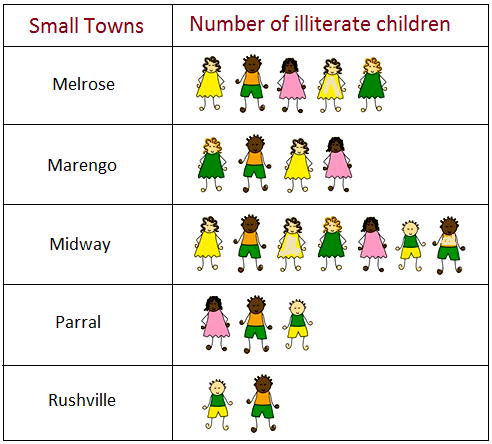 Number of illiterate children of 5 small towns, Melrose, Marengo, Midway, Parral and Rushville. See the picture graph or pictograph to answer the questions. 3. Information about 300 children of a school who come to school by different modes of transportation. See the picture graph or pictograph to answer the questions. The above explanation on the examples of pictographs or pictorial representation will help us to solve different types of questions on pictograph.